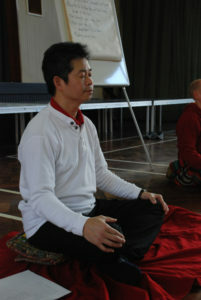 During meditation, in the beginning when we close our eyes we will find out breathing changed again. 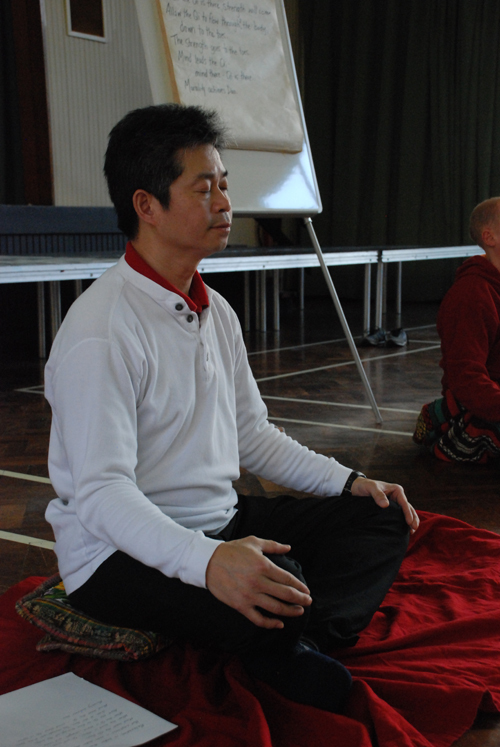 Sometimes we will breathe in and out in very deep breath and sometimes it will be shallow, this is particularly true when sitting in lotus position or the chair. 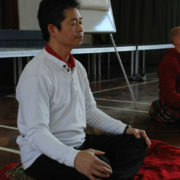 When the Qi is full we will find that we will even stop breathing, but actually the inside is still working. This must happen naturally and when it does that it is because we do not need air to come to our lungs to supply the body. If the body is in a very good condition then it can supply the energy by itself. However, this will be only for a very short time, perhaps only a few seconds, and then we will need to breathe again. During the time we stop breathing, the body is trying to push out the Qi through the acupuncture points, particularly from the head, from the Taiyang 太陽 points, Sky-eye 天目 and Baihui 百會 points. It is good that the Qi is pushing out through the acupuncture points as this means the points will be more open. When the acupuncture points of more open it means that we need less air and so we do not need to breathe as much. In the end the acupuncture points are open and all the channels are smooth and then our breathing get slower and longer and eventually our meditation is like sleeping. We can forget everything, like we are in the dream and then we will have no breathing or very long or very shallow breathing.